Synopsis: 5 years after the destruction of Chicago, all Transformers are in hiding as they're hunted down one by one by a rogue Transformer called Lockdown and a black ops team headed by a shadowy CIA agent (Grammer). When a nearly broke inventor named Cade Yeager fixes up a broken down semi-truck and discovers its actually Autobot leader Optimus Prime, he unwittingly makes his family the prime target of those who've been searching for Optimus. Andrew: Hello readers! This past weekend Sarah and I went against our better judgment and decided to shell out our hard-earned disposable income to see the latest installment in Michael Bay's immensely profitable toy commercial/product placement Transformers series, Transformers:Age of Extinction. If you couldn't tell from that opening sentence, this is not going to be a positive review. Sarah, I'll admit as much that I found, and still find, the first Transformers movie to be good and entertaining. But the second and third entries in this series......not so much. So we obviously weren't expecting too much from this film. So with that said, was Age of Extinction worse, equal, or better than the two films that came before it? Sarah: So I really wanted to like this one. I was hoping it was going to be a total reboot. And ooooooh it was not. It fell right in line with the horrible dribble that preceded it and I'm going to throw out that it was the worst of the bunch. If I had wanted to watch a two-and-a-half hour commercial I would have stayed home and turned on the Home Shopping Network. The groans that were issued during this movie were far, far too many. Just.....the worst. What did you think? A: I'm still not gonna go so far as to say it's the worst of the series - need I remind you that Transformers: Revenge of the Fallen had giant Transformers testicles dangling over the Egyptian pyramids? But it comes darn close to taking the crown. There are so many bad things about this movie that I don't even know where to start. Savoy (to his men): "Search the whole property!" Yeager: "Search the property?! You don't have a warrant!" Savoy: "My FACE is my warrant!" Seriously. That exchange happens. Just.....wow. S: Yeah, that is the perfect place to start. And while that line is awesomely terrible, it is followed by much worse and the acting helped the horrible along. I just want to say that this movie has some pretty good actors in it. I am a big Kelsey Grammer fan and Stanley Tucci is usually so great to watch on screen! Even Mark Wahlberg has his moments on the big screen. But here? They were all wasted. It was like, what was the point?! A: Yeah, the cast is actually a pretty solid cast - Wahlberg is a HUGE step up from Shia LaBeouf - but the script and mindless action going on around them does them no favors. On the downside for the cast, Nicola Peltz as Cade's teenage daughter and Jack Reynor (Delivery Man) as her Scottish race car driver boyfriend are pretty awful. At times Peltz made me long for the acting of Megan Fox. And speaking of wasted, T.J. Miller is in the film as Cade's employee/business partner for what amounts to a hot second, which is a damn shame. Miller is genuinely hilarious and I love the guy from his role as Erlich Bachman in HBO's Silicon Valley and from when we first saw him in She's Out of My League, and he's utterly wasted here. That all said, if we're being fair, the human characters in the Transformers films have never been the reason people go to see these movies. (Bay and Co. have made the mistake of making the actual Transformers almost secondary characters in their own films). So let's talk about the never-ending robot carnage that was on display and how mind numbing it was. S: That's pretty much all this movie was. Robot carnage. There was nothing but action in this movie. No story. And what little story there was, was pitiful. I just don't understand why there was nothing but action! It was like they let someone go crazy with the computer generation machine and then didn't do any editing. I would say that it was perfect for all the little boys with no attention spans who have Transformers toys at home, but with the language and the action violence, this movie really isn't a great choice for them! So who WAS this movie for? Because anyone with a brain would have been bored out of their minds! A: I'll give Michael Bay this: all of the action scenes looked fantastic. If there's one thing Bay has going for him, it's that he's a master at creating these gigantic, destructive action scenes. The downside to all of that is that he's now made four Transformers movies that, for all intents and purposes, feel exactly the same. There's really not much differentiating them from one another. And it's not even like Bay slowly escalates the size of the action scenes he puts in these films. Very early on a bounty hunter Transformer called Lockdown helps this American black ops crew track down and kill Rachet, one of the original Autobots from the first three films. It's a very big, explosive scene and it basically signals that the rest of the movie is going to be no smaller than this. So throughout the rest of the two-and-a-half-hours run time, all the action scenes just felt the same. There was no excitement there because it was very desensitizing. Hell, even when the Dinobots show up more than two hours into the movie, I couldn't have cared less because I just wanted the movie to end! S: Alright, that is a point I want to touch on. Was I the only one that was super confused on where the Dinobots came from? Actually, where ANY of the "prizes" that Lockdown kept on his spaceship came from?! It was another layer of the movie that just didn't seem to make any sense. Why was he there? Why would Bay add another layer like bringing these "Creators" into the story line? I think that is my biggest problem with this movie once I get past the horrific dialogue and acting. What was this added story?! I am so confused. A: I'll agree with you a little there. I know that the Dinobots came from Lockdown's spaceship/alien zoo/prison that he traveled around in, but where exactly did he CATCH the Dinobots? And when? That's something they don't make clear. In fact they sort of play it off as if these Dinobots are some legendary Transformers that turn out to be real, but considering they're not mentioned at all until Optimus Prime frees them from their prison, they kinda come out of nowhere. So yeah, that's confusing. This idea that there are "Creators" who created all of the Autobots and Decepticons and that they're the ones Lockdown is working for was also head-scratching, to say the least. We're shown a glimpse of the Creators at the very start of the movie as they apparently caused the extinction of the the dinosaurs and I guess they're aliens of some sort, but I'm starting to think that part of what this movie was made for was simply to set up the next one where Optimus Prime tracks down the Creators? I don't know. All I know is we probably won't be seeing the next one in theatres. There were also two very blatant product placements for Chinese products once the action shifted to China, with Stanley Tucci's assistant prominently drinking out of a bottle of water, and Tucci himself drinking a freaking juice box at one point (seriously). I know there are others I'm missing. Can you remember any more? S: Let's not forget Victoria's Secret and Tom Ford. I guess we know who clothed all the men and passed around underwear in preproduction. Cadillac was also all over the place, as was Ford and Chevrolet. But those were nothing new. It was way overkill but I think we also know how Bay paid for all the CGI in this film now. This movie was not good. And every now and then we like a good mindless action movie that is nothing but big explosions and unnecessary terrible lines, but not when we've seen the exact same things three times already. We could go on nitpicking it to death, but I think we're done. Besides the blatant product placement and terrible lines and unedited action scenes, the only redeeming quality was that they killed it with the quality of special effects. But that's where the compliments end. I do not recommend this movie. I do not recommend even seeing this movie at a matinee. What are your final thoughts? A: I'd agree that it's just not worth seeing. If you've seen the first three, you've essentially seen this one. Like I said earlier, the Wahlberg-for-LeBeouf trade is a definite upgrade, but that's really about it. I understand why they made this movie, it's going to make a lot of money when all is said and done, but that doesn't mean it's a good movie by any means. And I was dead serious when I said I have no intention for us to ever see the next Transformers movie in theatres. It's going to be amazing when people can compare the quality of this movie to the upcoming films coming out soon like Dawn of the Planet of the Apes and Snowpiercer. By all accounts those films are amazing. 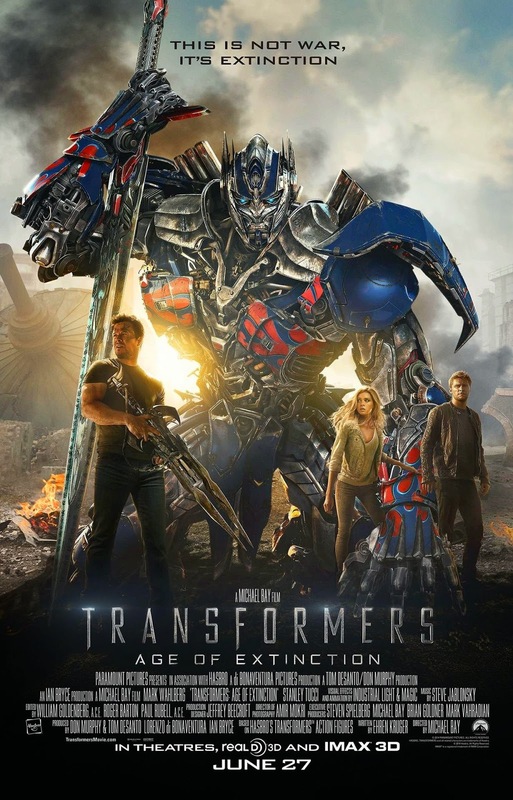 Transformers: Age of Extinction is the complete opposite of amazing. I'll give this a 1/5. S: I was going to give this one my lowest score yet, actually; .5/5.